Think of your workplace. Does it stress you out? Are you boxed in a cubicle under fluorescent lights? How productive are you in this setting? The workplace is expanding from the boring business office to a more functional workspace. Sodexo, a leader in quality of life services, released a study on global workplace trends. 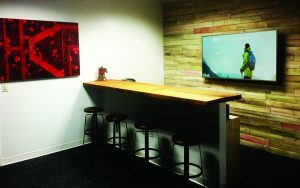 They say workplaces have evolved to include amenities and a sense of play to foster happiness and creativity. Take Google for example, it’s one of the most sought after employers in the world. Google tries to ensure their employers are comfortable and happy. Some perks include nap pods, free gourmet cafeterias, a free shuttle to commute and even a slide between floors. When quality of life is improved for employees, retention levels of the best and brightest talent are positively impacted. To put in perspective, what do you do to recharge and get inspired? How do you feel when you get back to work? According to the study, 74 percent of employees rated their work environment as either complex or highly complex, which can lead to being overwhelmed. The study also found 2/3 of companies believe complexity is an obstacle to business success and a barrier to productivity. Humanizing the workplace can remove unnecessary complexities. Sodexo’s study suggests a human-centric workplace, creating a space that employees thrive in. Rather than expecting employees to adapt to workplaces, the flexible design aims to help people feel and perform better. For example, if your company has a mix of generations, you can use moveable partitions for Baby Boomers and once they retire, you can take them down to mix with the open office environment for the younger generation. Part of the human-centric workplace is the ability to operate anywhere. Some offices use laptops for employees to be more mobile. They can work at their desk, move to a quieter area, or sit in a more comfortable chair. When you improve the quality of the workplace experience, you’re more likely to retain the best and brightest talent. But it’s not just about how your office looks; it’s about what your company can offer. Sodexo says becoming a desired employer is a major benefit to organizations that focus on the employee experience. Company culture defines the personality of a company. When looking for a new job, companies usually have a section about their culture on their website. They’ll promote flexible schedules, benefits, ongoing training, or even their pool table in the conference room. Some even have a stocked bar ready for a cold one at beer 30. Some other unique features at HCP is a large chalkboard wall that our design team changes up every few months with a mural of their choice. There is custom artwork with vibrant pops of color throughout the space. We also have a gourmet coffee bar area with a top made of a 100-year-old piece of Florida oak. With much of the workforce is seated at their desk all day, which is unhealthy. 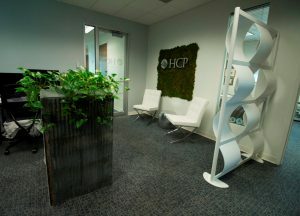 Some organizations, including HCP, opt to use stand up desks or exercise balls to sit on in replace of a chair. As for the future of the workplace, implications indicate that every aspect will be designed with the employee in mind, enabling work, play and life to blend into overall happiness and wellness.